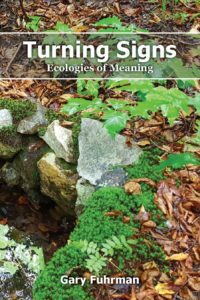 This is a hypertext netbook about the ecologies of meaning. It has two sides, an obverse consisting of 19 Chapters and a reverse consisting of 19 rePatches, and every part of it is hyperlinked to other parts, so that clicking on certain words or phrases will take the reader to a related part elsewhere. These links appear in a different color and underlined (depending on whether you ‘hover’ your cursor over them). This weblog is also hyperlinked to the rest of the internet, and each post links back to the main text of Turning Signs, which was published online by gnusystems on 6 September 2015 under a Creative Commons Attribution 3.0 Unported License. The obverse side is an essay which gradually unfolds the main concepts, and this has been published in conventional printed book format (ISBN: 978-0-9953376-0-2). To order the printed book or a PDF of it, email the author. The author of this book and this blog is Gary Fuhrman of Little Current, Ontario, Canada. His home page is here.